Cats get a bad rap on the Internet, frequently stereotyped as LOL ignoramuses, forever shredding grammar like a half-dead mouse in what the World Wide Web would have us believe is their endless quest for "cheezburgers." Despite the pigeon-holing, cats play piano on YouTube and have their own Facebook profiles, and kitties who tweet exhibit a working knowledge of sentence construction that challenges those of their human Twitter compatriots. So it was only a matter of time before a feline got around to earning an online high school equivalency diploma. Rescued from a ditch when she was no more than a teeny, tiny ball of fluff, Oreo C. Collins, a 2-year-old tuxedo cat from Macon, Ga., may be the very first in her family to obtain a 'high school diploma' � online or off. (Of course, we may never know for sure because, as she wrote in her "life experience essay" portion of the test, she's adopted.) Kelvin Collins, president and CEO of the Better Business Bureau of Central Georgia and Oreo's rescuer, encouraged Oreo to seek her "education," by taking part in the BBB's ongoing investigation of online diploma mills. "Oreo's a really smart cat," Collins said in a telephone interview with msnbc.com. So smart that Oreo garnered mostly As in the online test, with some of her credits earned from her aforementioned life experience essay about her adoption into the Collins family. No doubt that�s why Collins solicited Oreo�s help in the Better Business Bureau�s experiment to expose Internet diploma mills. Noting her humble beginnings by the side of the road where Collins found her during his son Brennan's football practice, Oreo's benefactor said he "is tickled pink to give her an opportunity to get an education." Following a test and a $200 fee Collins paid for out of his own pocket, the young cat received her diploma from Jefferson High School Online. Thanks for the news! Cats are smart. Even my cat finds out ways to trick me and get to the food before the time of feeding. Its about time their great minds are rewarded. Even animals can teach us the most valuable of things. Sadly there are Care2 members who do the same thing, like call themselves a Doctor of Natrophaty when they are in a state that licenses ND's and you discover all they really have is a BA. 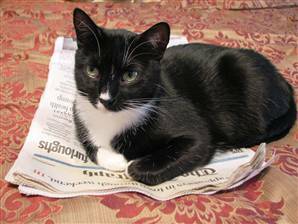 It looks like she's reading the newspaper now, so maybe she wants to be a journalist. I'm sure she could follow her nose to a good (fishy) tale/tail. She's a beautiful tux cat isn't she and so well read-I think she majored in the study of Cheeseburgers but I could be wrong. Thanks for your comments everyone. There are a lot of stories that I could put up but I don't always want to because I sometimes burn out and can't go any further -it is a story like this that keeps the wheels turning. Cats are smart and they don't need some dumb online fake dipolma or doctorate to prove that. Especially when dressed in their James Bond tuxedos! And Bill C. sadly there are members of Care2 who call themselves animal lovers, but actually spend their time bashing and investigating other care2 members. Must be like a FreeKibble game. Each time a member is bashed (named or unnamed) an animal gets a bowl of food? Go find another sandbox to play in - this is Raffi's sandbox!